A tradition that has transcended time states that Dominic was a man who went preaching through the cities drawing hearts to him like a magnet. Saint Dominic visited all his communities. He left Rome to visit Bologna and remained a short time; then he was on his way to Spain. Dominic arrived in Segovia! He was so happy; this was his native land; they understood him! But there was a sadness that crippled the people of Segovia; they were starving; a drought had robbed them of their crops. One day, as they were all gathered around, he exclaimed: “Fear not, my brothers, but trust in God’s Divine Mercy. I bring you Good News. Today the Lord will shower rain down from Heaven and the drought will be no more.” It came to pass that very afternoon; the people were drenched before they could arrive home! In Segovia, he formed a Confraternity of the Holy Rosary, and is known there as the Saint of the Preachers of the Rosary. Saint Dominic went to Paris, to direct those working in the apostolate, and to draw others to join. 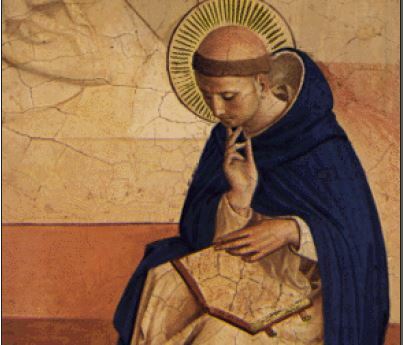 Then he was off to Italy and on May 27, 1220 Dominic arrived in Bologna, to attend the first General Chapter, which was called to define the rules of the Order. Dominic proposed a democratic form of government. The friars did not always agree with him; for example they all voted for Dominic as Master General, against his will. They addressed the slaughter of brothers by heretics against whom they were preaching. At night, when Dominic walked through the halls, looking in on the friars, he would sometimes encounter the devil walking as well, trying to distract the brothers when they were praying. He would sometimes take on the form of the Blessed Mother and pretending to be her, tell a brother who was disobeying his superiors, or not studying, that he was holy and the Lord was pleased with him. The devil told Dominic that he liked coming to the convent, but disliked the chapter room because of the good accomplished there. Many times, Dominic would meet up with Blessed Mother, just walking around the convent, checking in on her little chicks, sometimes sprinkling them with holy water as they were sleeping. Mother Mary would most often appear with beautiful young women, accompanying Her. This one night Dominic saw Mary sprinkling water on the friars and making the Sign of the Cross on each: but then he noticed she did not bless one of the friars. When he asked her why, she said that the friar wasn’t in a state of grace. Dominic went off to pray and suddenly he went into ecstasy and had a vision of Jesus with the Blessed Mother standing on His right; looking around he saw every Order but his standing before the throne of God. He began to weep, as if his heart would break; the Lord asked him why he wept; to which Dominic replied, “I weep because I see every Order before You but mine.” The Lord said that that was because He had entrusted his Order to His Mother. Then when the Lord asked him if he desired to see his Order, Mother Mary opened her mantle wide so that it covered all the heavens and underneath were friars extending beyond where the eye could see. With that he awakened from his ecstasy; he called the friars to prayer and began instructing them on the love and veneration owed to the Mother of God, Mary most holy. This entry was posted on Friday, August 7th, 2015 at 7:15 am and is filed under Saint Dominic. You can follow any responses to this entry through the RSS 2.0 feed. You can leave a response, or trackback from your own site.